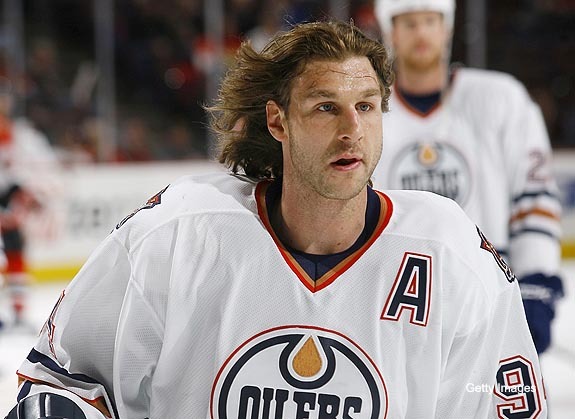 After an even 20 seasons in the NHL, aging Edmonton Oilers forward Ryan Smyth has announced his retirement and will play his final game in the league Saturday night against the Vancouver Canucks. Probably the team most’s iconic and popularly beloved player of its post-championship-dynasty period, Smyth hailed from Banff, Alberta, loved the Oilers growing up, and was legendarily hit by 1980s Oiler scoring star Glenn Anderson’s car while working at a hotel in his hometown (they were later teammates in one of Smyth’s first seasons and one of Anderson’s first). Even if he was not an Oiler for his entire career (he was painfully traded away in 2007, only to demand a trade back in 2011), Smyth is identified with the team and the city and its perceived work ethic and tenacity as no player has been since local product Mark Messier in the Cup years. Following hard on the heels of the trading of fellow longtime Oilers (and 2006 Stanley Cup Final run principals) Ales Hemsky and Shawn Horcoff, Smyth’s retirement cuts the final tether connecting the last great Oilers team and this motley current crew of massively talented but perenially disappointing young players. As steady and effective as Horcoff could be, as exciting as Hemsky’s sublime bursts of skill were, they were neither of them the folk hero that the man known as Smytty (hockey nicknames leave much to be desired) became locally. In a town with a self-image tied in with tough, dirty oil field labour and other related proletarian overtones, Smyth was the exemplar of on-ice spade work and grim, gutsy determination that has come to define not only Edmonton’s conception of “good” hockey but Canada’s as well. His defining on-ice moment for many fans came during the second round of the 2006 playoffs, when he lost three teeth to an errant puck but returned in the same game to set up Horcoff for a triple-overtime winner (the only decent video of the lost teeth incident features some tacky and uninformed Chris Pronger hate, but there you go). It’s a moment out of old-time, smash-mouth hockey lore; had the Oilers gone one win further that spring and won the Cup, the teeth would have ended up in the Hockey Hall of Fame (who knows, they still might, though their former owner may not). Despite this lunchbucket reputation, Smyth was a tremendously skilled player as well, topping 400 goals and 850 points for his NHL career. He was a scorer in his heyday, a power play specialist (tied for most PP goals all-time for the Oilers, topping the list with one more against the Canucks would be a sweet finish) and not a puncher or grinder. The tenacity and tolerance for punishment that characterized his front-of-net office on the man advantage were often emphasized, but the excellent hand-eye coordination and anticipation to screen goalies or deflect shots or bang home loose pucks before defending opponents could beat him to it testified to a high level of skill and ability. If his hard-working rep brought him closer to his fans, his gifted talents separated him from and set him above them. Like all great hockey icons, Ryan Smyth could seem both larger-than-life and just like the men and women rooting for him from the stands or the barstools or the couches. For my part, I well recall persistent Smytty in-jokes among myself and my Oiler fan friends. His habit of scoring shovel-in goals from in close to the net (this one from the 2006 Finals is an object lesson; how did it go in?) inspired the running joke that he scored every goal with his head like a soccer striker. His flowing hair likewise lead to a nickname that never shook itself from my head: Mullet in the Wind. Now, with Ryan Smyth’s career nearly at its end, adapting the lyrics of a famous Elton John musical elegy to the departed to include this phrase is indeed a tempting final tribute.